The island of Anafi is away from the busy ferry routs of the Cyclades. In the season you can reach Anafi by ferry boats about 3 times a week directly from Piraeus. If you want to go to Anafi from the Cyclades, it would be the best to take a ferry from Santorini, because from here there is a ship almost every day in the season. 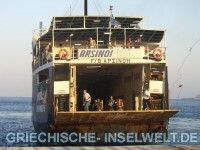 The ferry needs about 2 hours for the route Santorini - Anafi.